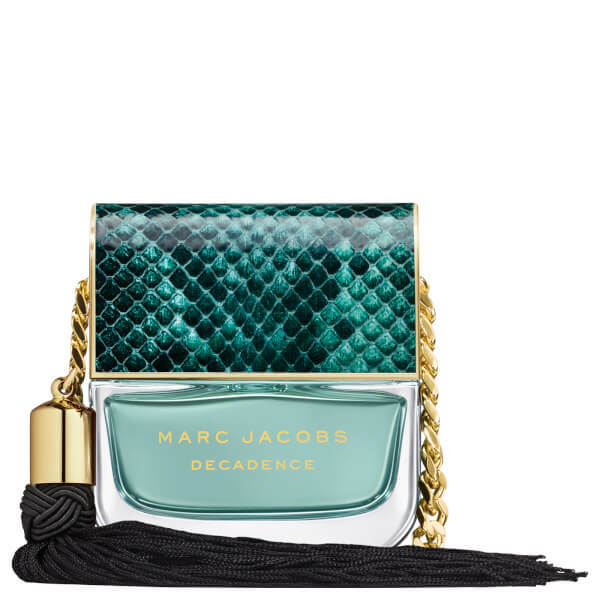 A new interpretation of the original fragrance, the Marc Jacobs Divine Decadence Eau de Parfum offers top notes of sparkling Champagne, Bergamot and Orange Blossom. Accentuated by a floral heart of Gardenia, Honeysuckle and Hydrangea, the perfume settles on a bed of Amber, Saffron and creamy Vanilla to create a characteristic scent for day or evening wear. Housed in a quirky, bag-shaped bottle in homage to Marc Jacobs' iconic designs. Composed by Master Perfumer Annie Buzantian. Top Notes: Champagne Accord, Orange Blossom, Bergamot. Heart Notes: Gardenia, Hydrangea Accord, Honeysuckle, Iris Flower. Base Notes: Saffron, Vanilla, Liquid Amber.